England’s professional sevens player, and World Cup winner, Rachael Burford, has opened the first rugby academy for girls and women in the UK. 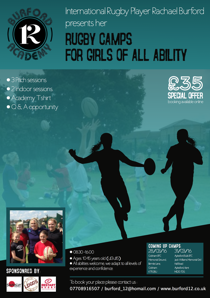 The Burford Academy is designed to inspire young girls to take up the game of rugby and in so doing help them develop their abilities and confidence, unlocking their potential both on and off the field. The Academy will be open to all ages and abilities, initially aimed at U18s but will cater to Seniors (over 18) and under 10s later this year – dates will soon be released. 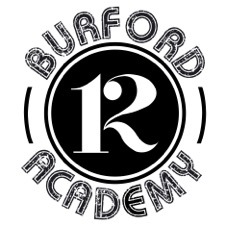 At a time when authorities are bemoaning the fact that so few girls take part in sport, the Burford Academy will offer a fun environment in which to learn new skills and get fit. It will also provide girls and women with inspirational role models, encouraging them to follow their dreams. The first camps will take place on 28 March in Surrey and 31 March in Kent and you can book a place here. We were lucky enough to get to chat to Rachael about her desire to leave a legacy in the world of rugby and for the name Burford to carry on long after she has finished playing. The full interview is below. RB: I used to work for the England Rugby Union and designed and ran rugby camps which I really enjoyed but it was a little ad hoc. I decided that it would be a great idea to organise something more structured and focused completely on women and girls. There are a lot of camps out there for boys but I wanted to do something purely for the women and girls. 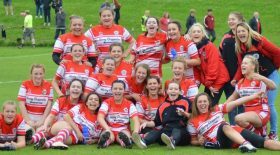 The aim is to attract more girls into rugby, keep current girls in the game, and to show them all that rugby has to offer, to give them confidence to fulfil their potential both on and off the field. The ethos of the Academy all about enjoyment and I firmly believe that developing/encouraging a player on and off the field yields better results. I would also like to create a legacy seeing my family name continue to be associated with rugby for a long time to come. 4tlos: Why now, at the beginning of Olympic year when you are so very busy working on your personal goals of achieving a place in the GB team competing in Rio have you taken this step? RB: Although we have only just launched, we have been working on this for 6 months planning and putting everything in place. So now that my evenings are free for rest, after training during the day, I have been able to spend the time on my laptop doing the preparation for the Academy. RB: To begin with we are holding a pilot with rugby camps in Kent and Surrey – areas where I have strong links, living in Surrey to the training Surrey Sports Park for the Sevens and obviously Kent which is where I first played rugby. From there the plan is to expand across the country and eventually abroad we have already been contacted by various counties who want to the Burford Academy to come to them. I will attend as many sessions as possible and I also hope to involve some of my England colleagues: Katy Mclean, Emily Scarratt to name but two who will both add an extra dimension to the camps. Obviously the topics will vary as they cater specifically to the age groups concerned. 4tlos: Have you already assembled a team to work with you to handle admin/organisation and help with the training? 4tlos: Will you work with local rugby clubs that girls can be directed on to and also to promote the academy? RB: We will work with clubs that are interested in working with us. We have already had a club get in contact, asking us to run camps for the girls involved with their club, since their own activities are centred around the boys. As an added interest to the rugby camps, the Academy will organise a mini tournament or rugby festival so that at the end of the training there is something to aim for. 4tlos: If you spot real talent you will be able to direct the player accordingly to a club that will nurture and develop her? RB: Our priority is not at all to focus on potential England players. While the Academy will not be elitist, it does has elite elements to some of the content on and off the pitch, and will be open to all abilities and ages, because it is all about girls being able to enjoy sport. However, if there is a player who would benefit from and would like to join a club then we will, of course, be able to direct her to a club with a good set up for girls. 4tlos: Women’s rugby is an apparently fast growing sport in this country, but unlike football, hockey and netball there is little rugby played in schools. 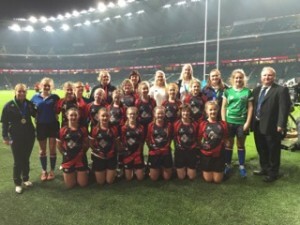 Would it be right to say that most women get into rugby at university unless, like you, they come from a rugby mad family? RB: Not at all, rugby is growing in schools as the England Rugby initiative ‘All Schools’ is really having an impact but it would be great to have rugby as part of the curriculum alongside the more traditional girls’ sports: netball, hockey and lacrosse. When I first started to play rugby it was in a boys’ team but when I was 12 I had to make the transition to an all-girls side. This wasn’t easy and having spoken to others who had the same experience we would like to be able to breach this gap and show girls that it isn’t intimidating playing in an all-girls team, it’s a terrific way of making new friends and building teamwork and relationships. RB: I’m now really looking forward to the first camp on 28 March in Surrey, it is so exciting to see this project, which is so important to me, come to life. I’d like to take this opportunity to say a huge thank you to our sponsors who have massively supported us in making the academy come true. Thank you – Restart Rugby, Samurai-sportswear and @striveprotein and Logos-to-gogo. 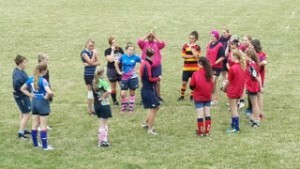 And, we at 4tlos would like to thank Rachael for taking the time to talk with us, it was an absolutely pleasure to speak with her we hope this will be just the beginning of a lasting Burford rugby legacy. It’s clear that this project is really important to Rachael and her presence at as many camps as is possible shows her level of commitment. We wish her every success both with the Burford Academy and with her playing career and hope she meets every goal she sets herself! You can find out more about Rachael from her website here and below you can find a brief biography giving just some of her many achievements. Rachael comes from a rugby mad family and started playing at just 6 years of age when she joined Medway RFC; at 16 she made her debut for the under 19s and also joined Bath Academy. At the age of 19 earned her first call up to the England senior side (having previously played for the U19s, England Academy and England A). Shortly after her 20th birthday Rachael debuted for the England senior side at the IRB Women’s rugby World Cup in Canada, where England lost in the final to New Zealand. After winning the World Cup Rachael was one of just 20 players awarded professional 7s contracts with the aim of qualifying a team for the 2016 Olympics in Rio, which the team achieved in 2015. High on the agenda now is selection for the GB team that will compete in Rio, following that Rachael will set her sights on returning to xv’s club rugby and hopefully selection for England again with 2017 6 Nations and another World Cup – after all England have a trophy to defend.